"Silvie is an exceptional teacher. She has a great motivating nature and is a pleasure to be around. I highly recommend her." "I highly recommend Silvie as a Czech language instructor. 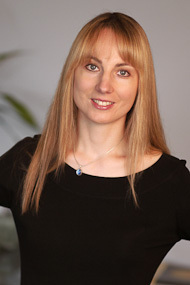 Silvie is a native speaker of Czech and fluent in English. She is able to explain complicated grammar in an easy to understand manner. She is very good with working on pronunciation. She is patient and listens and explains how to correct improper pronunciation. She is always prepared for the lesson and moves the lesson forward at your individual pace. She works to build conversational skills of listening and speaking while being sure the proper grammar is learned. She is an excellent instructor." "Silvie is a patient teacher with an excellent sense of humor – which one needs in teaching (or learning) a foreign language. She does a wonderful job of catering to a student's needs and creating lessons that improve the student in those areas." "Silvie is organized, responsible, and extremely intelligent. She knows the Czech language inside-out - the colloquial spoken as well as the more formal written. What is perhaps more important, though, is the reality that she understands how to most effectively pass that knowledge on to her students. Whether you’re interested in becoming fluent or just looking for a personalized "crash course" before traveling to the Czech Republic, Silvie is the person to go to." "I have been taking private Czech language instruction from Silvie Opatrna for 2 months and I am very pleased with the results so far. From the beginning, I was impressed with the care she took in understanding my specific goals and objectives. She even took time to survey my learning style to find out how I learn best. Each lesson is well-planned and focuses on building speaking and listening skills. Silvie is truly talented, has a personable demeanor and really enjoys teaching. I feel that I am receiving a high level of quality with Silvie and can easily recommend her as a Czech language teacher." "Silvie is an excellent teacher. Not only is she attentive to the student’s needs, but she is incredibly patient. She is one of friendliest persons I’ve ever met and as such, I felt immediately relaxed around her. Silvie creates an atmosphere that is fun, focused, and flexible. I highly recommend her especially if you’re a beginner like I am." "I am learning to sing a seven song cycle by Dvorak now. Silvie is helping me with my diction. She explained the difference between using the soft pallet versus using the hard pallet and the correct tongue position and structures of the mouth involved in producing the sounds. Also, she translated the songs word by word and explained the meaning of the lyrics very well. She really has a good sense of poetry. I strongly recommend her." "Silvie is a great teacher and made our lessons both thorough and fun. While she tailored my lessons to my specific needs and the purpose of my trip to the Czech Republic, she stressed grammar fundamentals. Learning with her made me want to continue to learn more advanced grammar as well as improve my speaking skills." "I am an American living in Czech for a second year. In between this year and the last, I returned home to Seattle for one year. During this time, I studied with Silvie once a week for 2 hours. Now, back in Nachod, friends and colleagues simply cannot believe the progress I've made with my Czech. Quite frankly neither can I. They are especially in disbelief of my accent; friends and strangers often smile and remark "hezky cesky". Silvie is quite strict about accent, and so are the rest of Czech people. Sometimes it really is the difference between being understood or not. At the moment here in Nachod, I haven't got a Czech teacher. I often wish I had a little pocket Silvie to help take me to the next level. Her lessons are very organized yet leave plenty of room for what the student wants and needs on any particular day. I teach English here in Nachod, and Silvie's lessons have helped me to become an even better teacher of English."